This map was supposed to be released in the Warzone CH2. package, but the level themed for this map has been cut & most likely will not return. 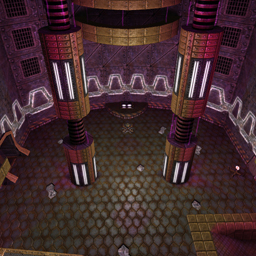 Stasis is a symmetrical map designed specifically for small-party CTF, but all other modes are compatible. I have more to say about this map but I don't have any time right now, so just two things. -There are teledests at doors on the upper level in the middle, but I can't find the teleports to them anywhere. Do they still exist? -You should probably clip/no-clip in the tunnels because while the wall struts look nice it's very easy to get caught on them. The teleports are only usable on CTF, they're inside the teamspawn rooms. This is actually a quite interesting and unique ctf map. The one-way doors to the flag create an interesting dynamic. The purple light seems a bit excessive. the violet tint of the light should really be turned down a bit. It gives the map a unique look for a texture set that is used very frequently, but I guess I just don't like it that much. The passages are all narrow, though there's easily enough headroom for bunnyhopping. Though narrow routes don't matter as much in smaller matches, it still comes down more to reaction time rather than skill if you can't dodge. I guess I didn't have as much to say as I thought. I put the one-way doors there because without them, you could just rocketjump from platform to platform, cutting your flagrunning time in half. Clipping: I've found more spots where you get stuck while playtesting it again yesterday, the updates will be online within the next week. I'll change some of them to light-white (colour 100 100 100) & possibly some lime-green. As already said by Mmeaninglez, this seems to be an interesting, yet unique map. There are a lot of things, that could be improved though. You wrote, that it should look "dark & mysterious", but it does not look like that at all. It rather looks more like a disco and the light is very repetitive. There are also a lot of light-textures, which do not emit light at all: that looks odd. I would suggest to set ambient to 0 (or very low). Using textures like "lunaran/light_fluoro_1d", you should put 4 small lights (newent light 15 r g b) along the texture and one bigger light (newent light 100 r g b) a little further away. This way you get a better contrast (and it looks more realistic). In general I would suggest reading through Hourences' lightning tutorial (http://www.moddb.com/tutorials/lighting-in-game-environments-the-hows-and-whys). I like the effect, the purple lights have on the lunaran textures. You also seem to know how to apply/adjust textures. Some places look very boring though, especially the large/high walls. Maybe you could try to make them look more interesting by adding some horizontal levels or adding more depth (some rooms behing glass or fences). This also applies to the floor. I like the basic layout. It could be greatly improved/tuned though. The way it is now, it is unbalanced: very large rooms & very cramped/small rooms put together. Maybe you would try to scale up the smaller rooms to make it all fit together better. I do not understand much about ctf, but what Mmeaninglez said about the one way doors sounds convincing. I did not check it all yet, but the yellow armours places just feel annoying. I forgot to mention, that the sounds are annoying. They fit the atmosphere, but use a smaller and fading radius and assign them to some logical source (a computer or tele).